"Something went wrong in the opening. I made one illogical move after the next and then I missed something with this knight move. And then I was just basically lost," Anand said at the post-game press conference. 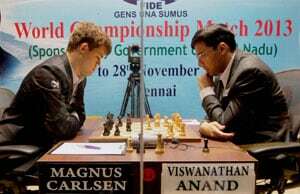 Defending champion Viswanathan Anand on Wednesday conceded that he came out of a lost position in the fourth game of the World Chess Championship match against Magnus Carlsen of Norway, which ended in a gruelling draw here. "I am sure he had many wins in what he played. Towards the endgame it was a little bit scary in this four rooks endgame but finally when I gave a check on a8 and then moved my rook, I was safe," Anand said. "I was lucky twice. Just before the time control I could give a check and made my next move and reached the time control. It happened twice." Asked whether he missed losing the pawn, Anand said: "I didn't really miss it. If I didn't play Ne2 what do I do. I was just being consistent." Carlsen was pretty happy with the way things went for him today. "I was doing pretty good, and then when I won the pawn I was very optimistic. He kept on finding resources and I was missing some little things. He really fought very well. It's bit of a pity to have spoiled such a good position but it was a very good fight," he said. Carlsen was all praise for Anand in his usual ways. "He kept finding very good resources that at least I could not deal with. I didn't see any clear win. Anyways you have to do something and right before the time control I thought I might be winning but it was not the case. It's not so easy, there were many tactical possibilities. I was just trying to navigate through them," he said. On a lot of energy going in these long games the Norwegian showed his funny side. "It's a rest day tomorrow and we are playing a world championship match. On move 56 Anand had one minute, there is a chance that he will fall in to checkmate," explained Carlsen on why he was continuing in a level position. Anand said something similar about Carlsen. "Magnus too kept on finding resources when I thought it should be a draw. I was lucky that I could play last two moves quickly when down to one minute." The match will resume after a rest day on Thursday and Carlsen will have white pieces in the fifth game.